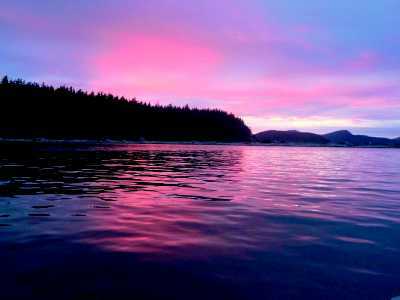 ---Information: Spencer Spit State Park is a 138-acre camping park situated on the eastern flank of Lopez Island. The park is named for the sand spit, that encloses a saltchuck lagoon. ---Access: About four miles from the Ferry Terminal on Lopez Island.The park provides two kitchen shelters, each including four picnic tables, a barbecue grill and fire pit. There are five unsheltered picnic tables. Water is available nearby. On the beach site (a part of the Cascadia Marine Trail), there are six picnic tables with fire pits located on the spit. There are 12 mooring buoys for the convenience of motorized vessels. 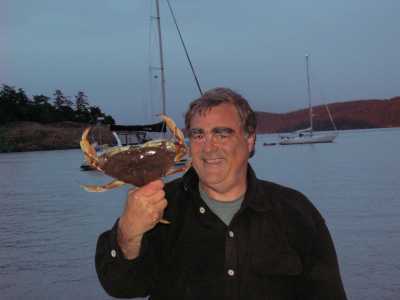 ---Comments: The park has a reputation for excellent crabbing, clamming and "car-top boating." This is one of the few state parks in the San Juan Islands that is accessible by automobile. There are two miles of hiking trails. 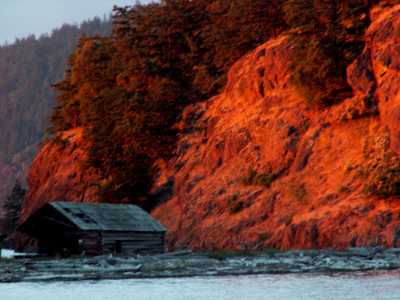 -----In the past,as Native American tribes migrated up and down the coast, they stopped at Spencer Spit to clam, crab and fish. No permanent Native American sites have been found here yet. Native activity continued until 1946. -----Spencer Spit was homesteaded in the late 1800s by a family named Troxell. It was eventually sold to the Spencers who lived on the property for 50 years. State Parks bought the property in 1967. 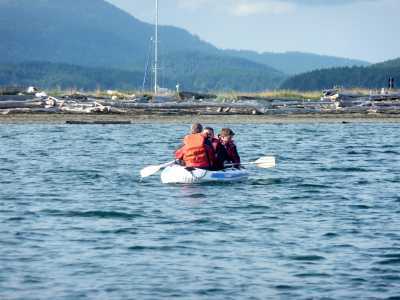 -----There are excellent anchorages to the north and south of the sand spit. One can dinghy ashore for walks and birdwatching along the beach areas. -----Because there is auto access, some (including our grandkids) don't think this is a good site for sleeping ashore, and they find the park somewhat overused.